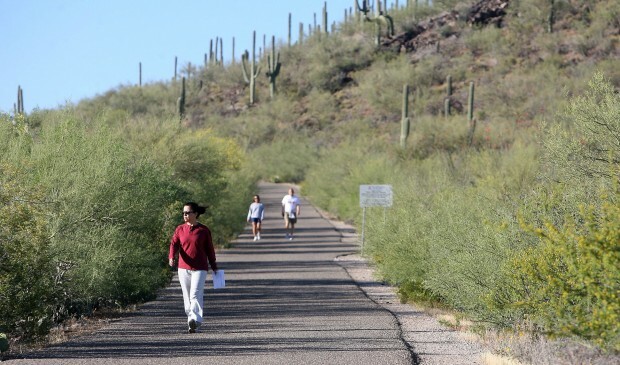 Lupita Pe-a and others hike down Tumamoc Hill, where a 125-foot radio tower - 55 feet taller than existing towers it will replace - is planned. The University of Arizona will have the final say. Plans to construct a 125-foot radio tower and consolidation of existing radio facilities on Tumamoc Hill were put on hold Tuesday by the Pima County Board of Supervisors. The board voted unanimously to delay approval for the roughly $105 million overhaul to emergency services communications until three public meetings are held on the project. The plan is to build a 125-foot radio tower - 55 feet taller than existing towers it will replace - and a single building on Tumamoc Hill. Three smaller towers, one 70 feet, one 60 feet and one 40 feet, and two buildings already on the hill west of downtown would be demolished. Part of the communications upgrade includes equipment for the Pima County Wireless Integrated Network. The network, funded through voter-approved 2004 bonds, is meant to facilitate communication among public safety agencies during an emergency. Users of the existing towers serve Tucson, Pima County and the University of Arizona's KUAT. The upgrade is needed because the current public safety communication network consists of outdated radio systems that make inter-agency communication rough at best, said Paul Wilson, Pima County sheriff's captain. "Today I can't get on my radio and talk directly to a Tucson police officer or a fire responder," Wilson said. "We are all kind of struggling to maintain the systems that got us to this point." The network would enable 32 public safety agencies throughout urban and rural Pima County and in Tohono O'odham and Pascua Yaqui tribal lands to communicate directly with one another. Supervisor Richard Elías was the sole member of the board to voice an objection to the project. He said the five tribal groups that consider the hill holy and members of the public who use the hill for recreation should have an opportunity to weigh in before the project goes forward. "Honestly, this is an aberration to the terms we have agreed to in regards to protecting Tumamoc Hill," he said. "I would like to see a series of public meetings because we swore to protect it, and it is an iconic symbol to the area." The only alternative put forward by Motorola, the project's contractor, would be to build two additional sites around the hill in order to get coverage at Pima Community College West and Starr Pass, said John Moffatt, Pima County's strategic planning director. He said the two sites would cost approximately $2 million more. Wilson said the county has been in consultation with the Arizona State Historic Preservation Office, the University of Arizona and Southern Arizona tribal groups, which have issued a resolution in support of the plan. The University of Arizona owns the land where the tower would be located and will have the final say before the project is given a green light. If the board approves the project, a letter will be sent to UA President Robert Shelton for final approval. Wilson said the initial plan was to have the network up and running by early 2014. "Today I can't get on my radio and talk directly to a Tucson police officer or a fire responder. We are all kind of struggling to maintain the systems that got us to this point." Will Ferguson is a University of Arizona journalism student apprenticing at the Star. He can be reached at starapprentice@azstarnet.com or 573-4142.